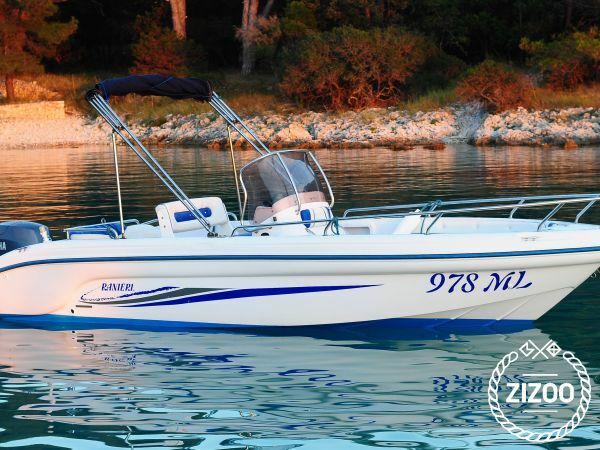 With or without captain 7 people1 days min.09:00 / 19:00 Description of Emil's motorboat Based in Mali Lošinj in Kvarner Bay this Ranieri Soverato 565 motorboat is an open type boat with a sundeck in the front end. The motorboat is equipped with a new bimini top, a compass, radio with USB ports and much more. It also comes with all the equipment necessary for a safe stay on board. Ranieri Soverato can take up to 7 people on board and will fit perfectly for a vacation trip with a family or a day of fishing with friends. Ranieri Soverato is powered by a 115 HP Yamaha engine that gives it the power to take you anywhere you'd like. Our motorboat is moored in Mali Lošinj, a popular tourist destination and a place of long history and tradition. Mali Lošinj is located in the Bay of Kvarner and it is neighbored by some of the biggest islands in Croatia like: the island of Krk, the island of Cres, The island of Rab. Cruising around this area is highly recommended and advised. If you do not possess a valid skipper license, a skipper is available for you on demand. All fuel expenses are not included in the price.